The Nike Flyknit Roshe Run "Multicolor" is nothing new – the style has been around for a while now in both retail and NIKEiD form. What is new about this option, just introduced to NIKEiD under the name "seasonal multi," is its use of the the rainbow look. The shoe uses black as a backdrop, filling in the cells of the upper in black and letting the lines that break them up wear the multicolor look, where previous versions did the opposite. 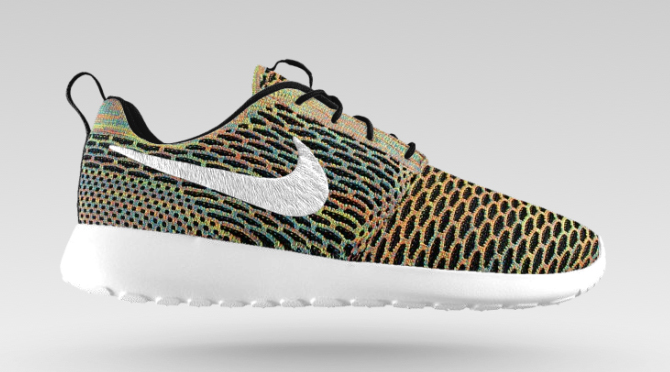 This Nike Roshe Run style in all its multicolor Flyknit glory can be customized now on NIKEiD.